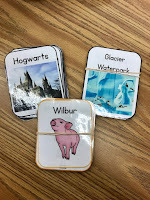 Story Based Literacy is one of my favorite things to teach! What is it? 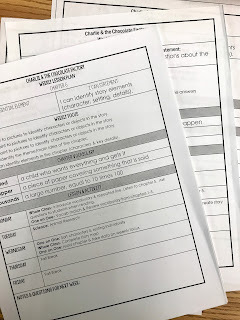 It’s exactly what it sounds like- using grade level texts to teach literacy. Students without disabilities need to be able to access age appropriate literature. This increases reading interest, reading skills, and the understanding of literacy components that are required by the state standards. Students with disabilities do not have the same opportunities to access literature because their reading level is well below their peers. SBL provides access to age appropriate literature, in turn building on the all of the above skills. There are many components to literacy instruction. This is what it looks like in my classroom. I focus on the following components. Vocabulary- I choose 2-3 words per chapter. The words that I focus on are words that my students will hear and come across on a regular basis. I like to choose words that repeat themselves throughout the chapter or book. 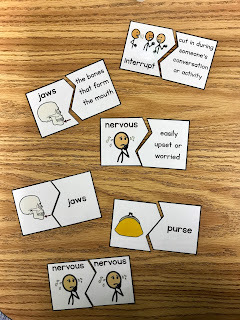 I explicitly teach the vocabulary, and then my students complete a vocab activity on their level. Every 3-5 chapters, we do a vocabulary review, like BINGO. Comprehension- Because we read the chapter several times throughout the week, I can really focus on student comprehension. I set a monthly comprehension focus for each student based on their instructional level. Some students work on yes/no questions while others may be working on main idea questions. 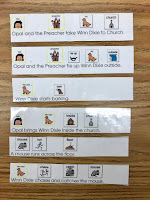 I create a chapter communication board with characters, settings, vocabulary and answers to possible comprehension questions. 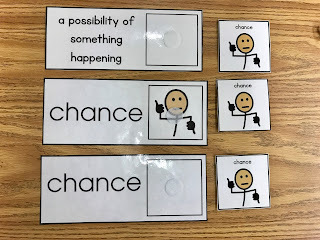 For my students who need limited choices or use eye gaze, I create flash cards with the same pictures that are on the communication board. 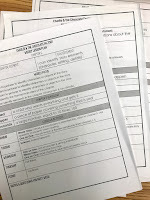 I record comprehension data once weekly for each student. Repeated Line- A repeated line essentially tells the main idea of the chapter. It’s a way to get all of my students involved in the reading. 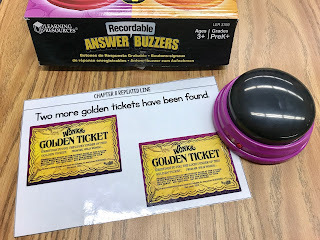 I use recordable buzzers (affiliate link) for my non-verbal students and a visual for my verbal students. As we read, I signal to the students and they say the repeated line. Writing- Another important component of literacy instruction is writing. It’s easy to implement a weekly writing prompt related to the chapter. I’ve also done interactive notebooks in the past, and each week students write a sentence, or paragraph, that summarizes the chapter. For my students who are unable to write, I use cut and paste sentences, or alternative pencils. Activity- My favorite part of SBL is being able to integrate other subject areas through weekly activities. 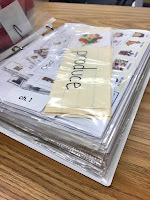 Each week, I find a cooking, science, or social studies activity that ties into the chapter. And finally, freebies! Click here to grab my weekly outline template and communication board template. Questions about Story Based Literacy? Leave them below or shoot me an email! I’d love to chat more about how you can incorporate this into your classroom! 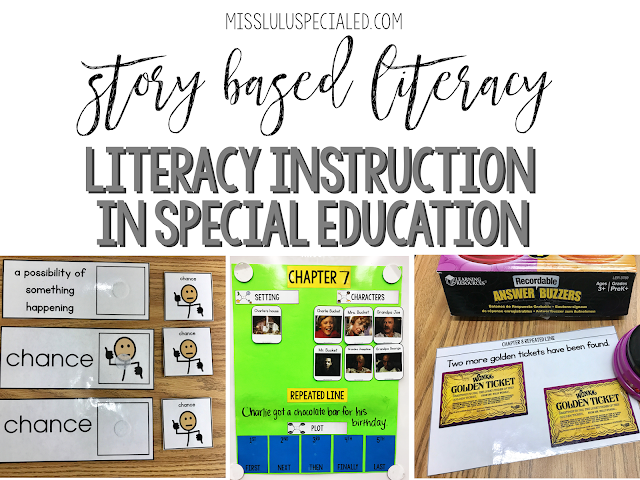 I love this idea and your visual supports are awesome...but I have found that my students (3rd-6th)have a comprehension level of about a F&P level D if I read it for a week with visual supports, vocabulary teaching, and matching activities. I'm trying to wrap my mind around reading something at this level to them. Do you simplify the language of the story or just read and let them get what they can with the visual supports and the repeated line? Hi Eileen- thanks for reading! My students are on a similar level. I do not usually adapt the text- it's already so much work to create the visual supports. For my students with lower comprehension, I limit the number of visuals presented. I don't usually use the communication board and instead present an array of 2-3 flashcards. I also will narrow down the types of questions I ask, for example, only "who" questions or only yes/no questions. I find that most of my students do make gains, especially if I have a clear focus. Hope that helps! I have been doing much the same literary activities as you do for about 12 years in SPED. High School Level. My kids usally range from 2nd grade to 5th grade reading levels. Literature activities touch on so many of our goals. I have found it to be extremely beneficial especially in areas of comprehension. So many of my students have discovered reading through these activities! I greatly enjoyed your article. Keep up the great work!